John Lennon putting a bottle up to his nose in "A hard day's night"
George Harrison,Patti Boyd,and Ringo Starr on the set of "A hard day's night"
Maybe this would be better placed in the Forum Discussion board. Anyway, looks like someone likes the Beatles! I think they're okay, I don't really find any songs except "Hey Jude" that catchy. I especially like the one with John Lennon's eyes closed. George Harrison and Patti Boyd on the set of "A Hard Day's Night"
Those are great! I love them. I know,they're my favorite band of all time! oh,and can you please post the one you did of John?You mentioned it before but you forgot about it.but I would LOVE to see a picture of my favorite Beatle. By the way,who's your favorite Beatle? 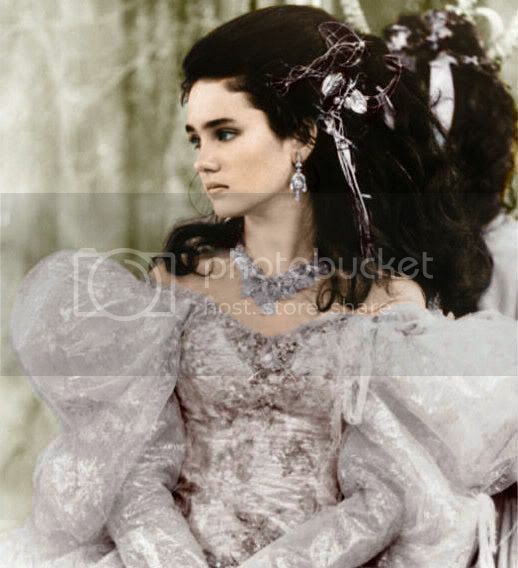 Here's one of my non-royalty colourisations, Sarah from Labyrinth, played by Jennifer Connelly. Thanks for starting up the thread! And that is my favorite Romeo and Juliet movie. We watched it when I was a freshman, and I loved it. I have the DVD. i wish i had it on DVD! i love that movie.. so sad! it almost made me cry! They're my favorite too! When I find the time, I can scan some of my things so you can see them. Alex, from my all time favorite movie, A Clockwork Orange.